You are browsing the archive for Training. I know what you must be thinking… “What was he thinking? !” Well, I’ll tell you. It was quite simple. I was thinking “Chicken”. 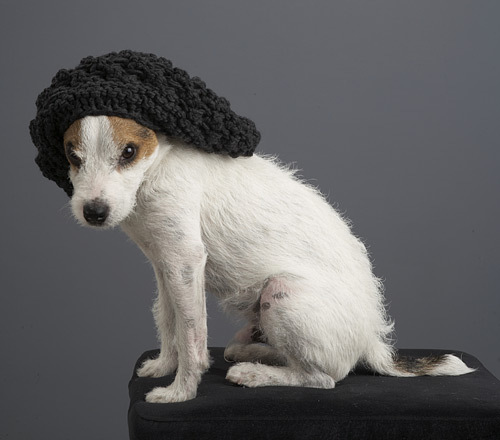 Dad was doing a shoot for Oscar’s mom (Oscar and I go to the same dog run) and she makes hats and scarfy things. Some female humans were wearing the hats for the photo shoot, but when they were finished, Dad thought it would be funny to put one on me. Geepees! That was uncomfortable… there weren’t even ear holes! Don’t get me wrong… the hats were nice on the modeling girls, but personally, I’d rather chew them than put them on; that’s just not natural. Still… the chicken was goooooood! Also, Dad finally figured out that my body was better in profile so that my peeing leg wasn’t pointing straight at him.